"Angelus Collector Edition Acrylic Paint for Shoes, Sneakers,Bags,Boots"
Angelus Collector Edition Leather Paints are brilliant in color and are to be used for decorating, staining, or edging smooth leather and vinyl articles. Many used the Angelus collector edition leather paint to paint sneakers to make it into custom sneakers the way they like. Ideal for painting special areas on western boots, belts, tennis shoes, purses, jackets, etc. 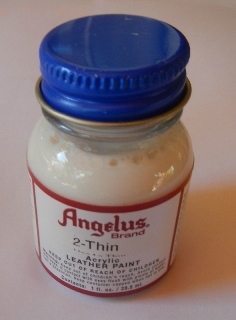 Angelus collector edition leather Paint, when dry, will not peel, crack, or rub-off. Waterbased for easy clean up. To promote a higher gloss finish on some leathers, first apply Angelus Clear Acrylic Finisher, let dry, then apply paint. When properly applied, Acrylic Leather Paint will provide a flexible, permanent, water resistant finish.